China — CHINALAI TRIBAL ANTIQUES, LTD.
Huayao silk and cotton embroidered head cloth, Hunan, China, early 20th century. A length of plaid cotton cloth with cross-stitch silk embroidery displays a wide colorful band with confronting birds at each end. The cloth was wrapped around the head many times to form a layered turban. Most antique artifacts from the Huayao are quite rare as the population is small and their textile tradition has diminished over time. Maonan silk and cotton wedding blanket, Guangxi, China, 19th century. A rare and lustrous tapestry woven blanket bordered in plain-woven cotton. Buyi or Zhuang silk and cotton wedding blanket, Southwest China, turn-of-the-century. The overall presentation and unusual background color make it appear as if the florets are floating in space. Danzai silk and cotton woman's jacket, Guizhou, China, 19th century. Antique jackets with silk embroidery on cotton in very good condition like this one from the Miao people of Danzai are very rare. Yao silk and cotton woman's head cloth, Guangxi, China, early 20th century. Similar embroidered head cloths may be from northern Thailand or Laos. Yao Lantan priest's silk and cotton shaman's robe, Guangxi, China, late 19th century. Replete with auspicious figures and symbols in silk embroidery on cotton, robes like this one empowered the highest level Yao priest or shaman to perform ceremonies and intervene with ancestral ghosts. Ha Li woman's silk and cotton skirt, Hainan, China, early 20th century. An important procession takes place in an exceptionally wide band around the mid-point of this excellent example of a Ha Li ceremonial tube skirt. Hezhen fish skin jacket and pants, Hielongiang, China, mid 20th century. In the latter part of the 20th century only one or two families could still produce clothing like this made of joined pieces of fish skin, which makes even the later pieces extremely rare. Ha Li woman's silk and cotton skirt, Hainan, China, turn-of-the-century. Row upon row of ancestor or processional figures in discontinuous silk supplementary weft make this an outstanding example of a Ha Li tube skirt. We have seen only a few of these Taoist hand-painted robes from Hunan, mostly on linen. The cotton base on this one gives a certain brightness and clarity to the painted figures. Ha Li woman's silk and cotton jacket, Hainan, China, early 20th century. Yao (Mien) priest or shaman's hat, South China, northern Laos, Thailand or Vietnam, 19th century or earlier. For the highest level Yao priest, a hat of woven human hair conferred spiritual authority. According to the testimony of a priest in northern Thailand in the 1990s, even a small patch of human hair from a worn out old hat could serve to sanctify rituals. A complete hat is rare and highly important. Ha Li silk and cotton skirt, Hainan, China, turn of the century. Subtle and abstract ancestor figures adorn this excellent example of a Ha sub-tribe Li woman's skirt with a brocade weave. Meifu Li silk and cotton head cloth, Hainan, China, late 19th or early 20th century. One of the most rare and graphic of the Meifu Li women's head cloths through silk embroidery on cotton at each end of a long narrow cloth wrap. 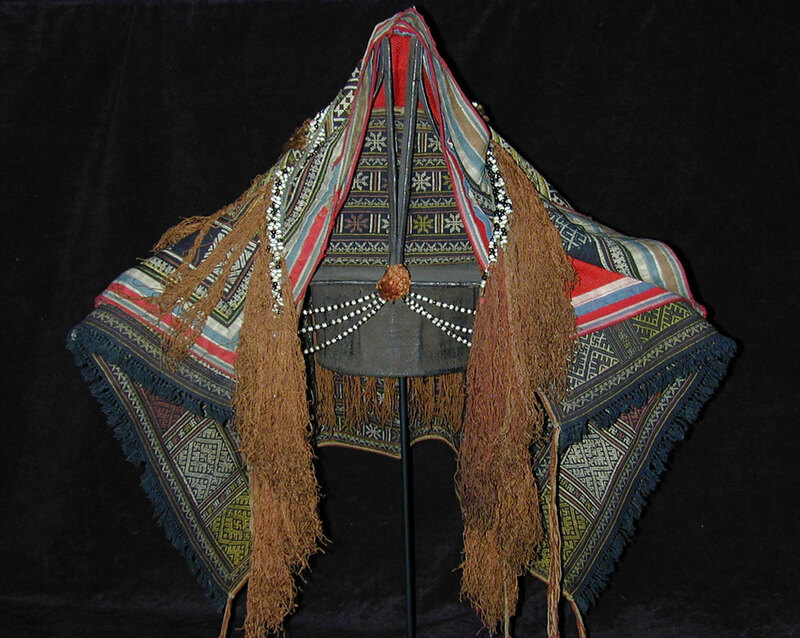 Dandu Miao woman's jacket, Guizhou, China, early 20th century. A superb example of a Dandu Miao festive quilted woman's jacket which incorporates several sewing and dyeing techniques: embroidery, calendaring with egg white and colorful batik. Meifu Li woman's silk and cotton head cloth, Hainan, China, turn-of-the-century. A very full and rare Li woman's head cloth of silk embroidery on cotton depicting spiritual and everyday life. Miao woman's silk and cotton top, Guangxi, China, early 20th century. Silk square patterns in cross-stitch embroidery on cotton identify this unusual top as belonging to Miao from Guangxi Province. Yao woman's headdress and bone comb, Guangxi, China, early 20th century. Yao woman’ headdress of stiffened cotton covered with a folded embroidered head cloth and adorned by three bright red pom-poms. A separate etched bone comb with glass beads was worn at back and added a fourth pom-pom to this very distinctive hat. Maonan silk and cotton blanket, Guizhou or Guangxi, China, 19th century. 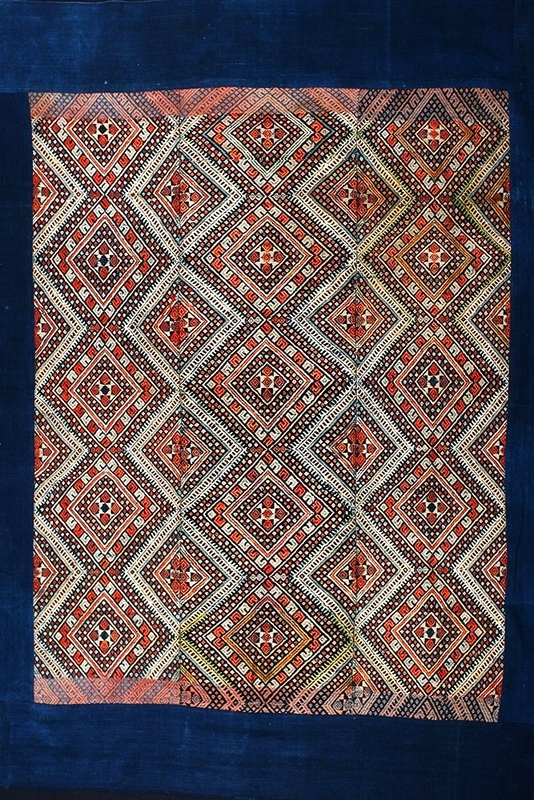 A very rare and lustrous Maonan wedding blanket of silk supplementary weave on cotton. Buyi silk and cotton blanket, Guizhou, China, late 19th century. A vibrant Buyi wedding blanket of silk supplementary weave on cotton. This is a highly unusual example that follows the typical construction of wedding blankets but is replete with cranes and phoenixes, feminine symbols. It was probably a presentation blanket for a matriarch, perhaps on her 60th birthday. The significance of the Maonan blankets in the life cycle is exemplified here even though its purpose may be atypical. 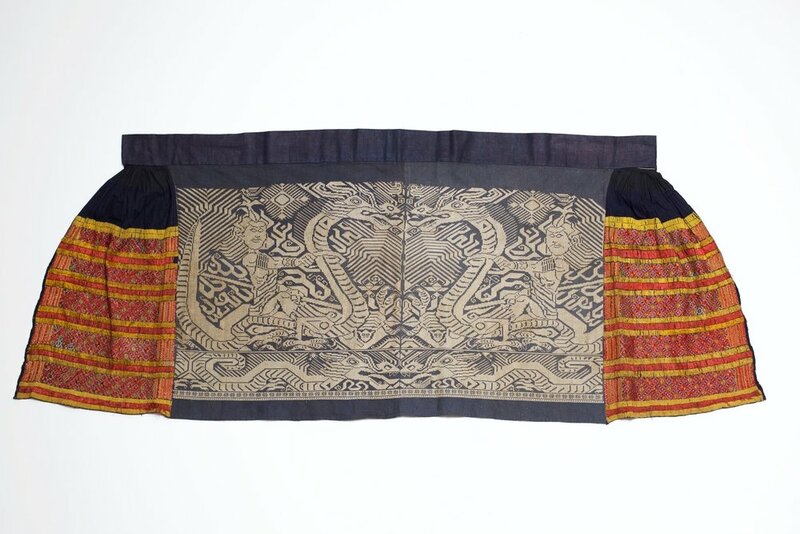 Yao silk and cotton head cloth, Guangxi, China, circa 1900. 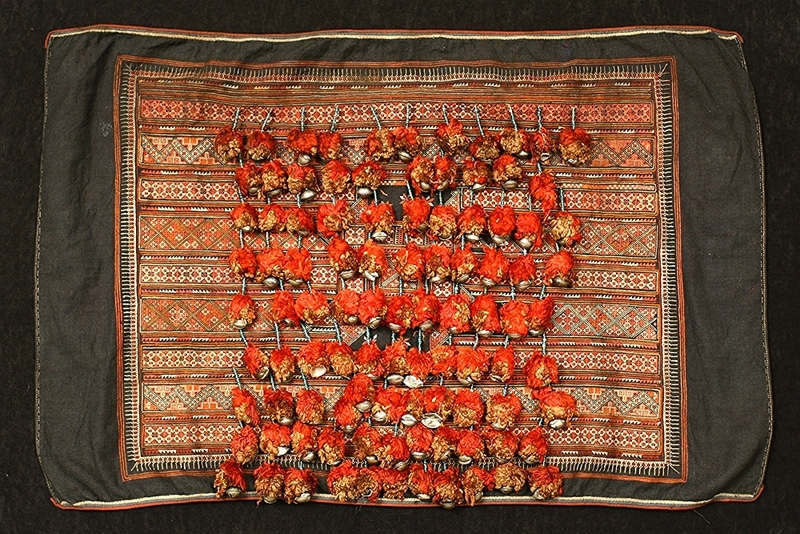 Not every Yao embroidered head cloth displays rows of pompoms like this one which was worn as the top layer of several similar plain or embroidered cloths that covered a Yao (Mien) woman's structured headdress. 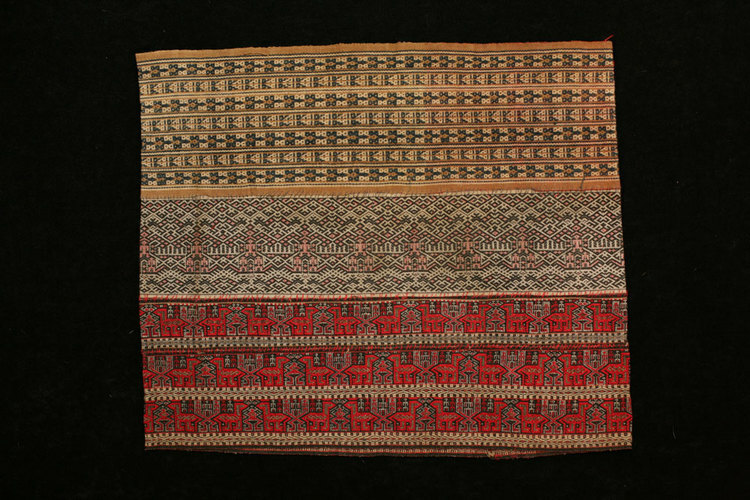 Hmong cotton skirt, south China or northern Thailand, early to mid 20th century. 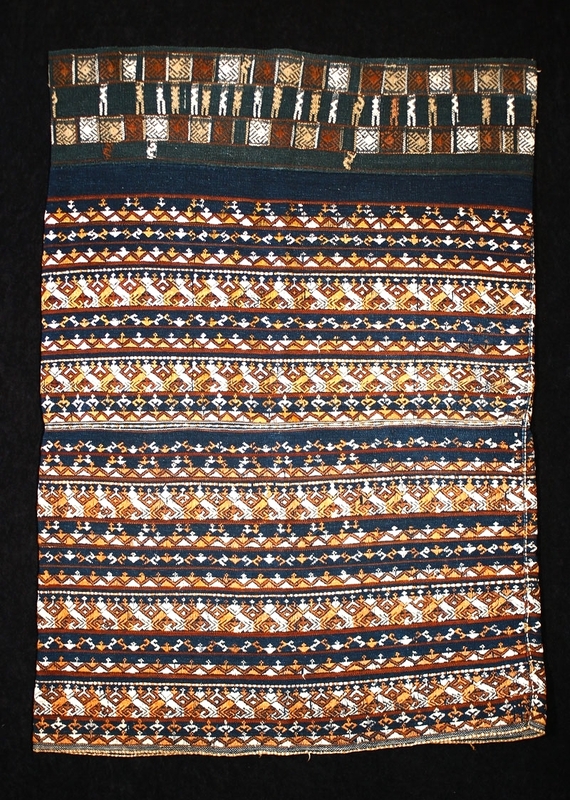 This labor-intensive Hmong woman's skirt features fine indigo batik along the bottom and hundreds of small pleats. Miao cotton hanging, Guizhou, China, early 20th century. Indigo dyed stenciled batik on three joined panels with fine detail in the figures of dragons, chili and phoenixes. Meifu Li skirt, Hainan, China, early 20th century. Meifu Li women's skirts with symbols and figures depicted in ikat fall into two categories: those with a band of silk supplementary weft and those that without that alternate ikat with plain weave. Those with the supplementary weave speak to a higher level of the weaver's skill. Stenciled batik creates a night and day presentation with positive and negative graphics juxtaposing geometric and humanoid forms. Li silk and cotton tapestry, Hainan, China, early Qing period, 18th-19th century. Long bei (dragon cover) in three separate woven cotton panels. 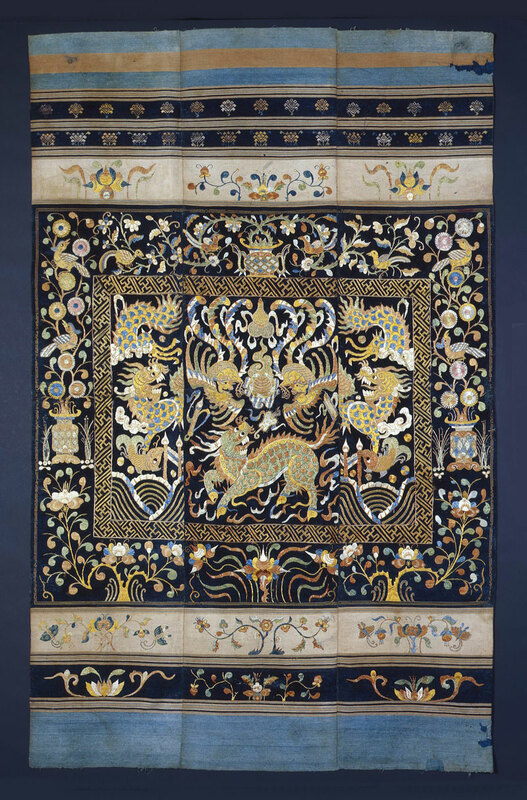 The rich, dense and vibrant silk embroidery includes an elaborate floral theme with flowers, vases and birds surrounding a central rectangle with mang dragons, qilin and phoenixes. 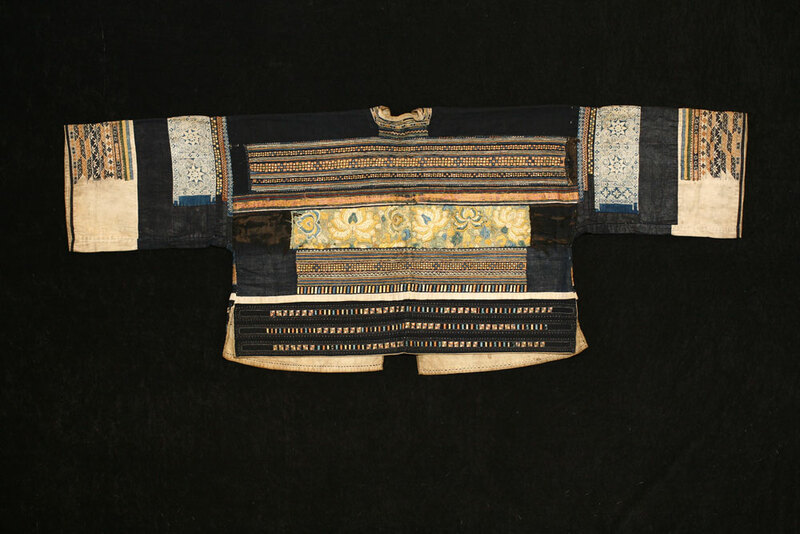 Miao silk and cotton jacket, Guizhou, China, early 20th century. Quilted woman's jacket enhanced with touches of silk embroidery. Yao headdress set, south China, early 20th century. 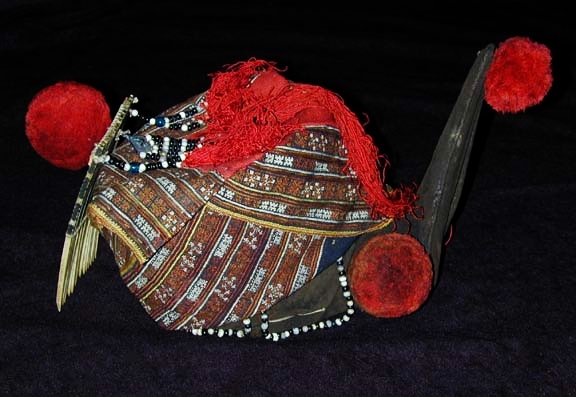 One of many fascinating varieties of headdresses used by Yao sub-tribes during festivals and ceremonies, this hat with two peaks of stiffened cotton and strings of glass beads supports streamers, tassels and layers of plain and embroidered head cloths. Meifu Li silk and cotton skirt, Hainan, China, turn-of-the-century. An outstanding example of a Meifu Li woman's skirt with ikat and silk supplementary weave. Yi cotton tunic, Sichuan, China, early to mid 20th century. A wonderful example of a Yi wedding tunic made striking through the use of bold and graphic appliqué. Ha Li silk and cotton skirt, Hainan, China, early 20th century. Many Ha Li textiles feature ancestral or processional figures indicating they most likely were used for festivals and ceremonies. The presentation varies with sub-tribe or village. Tujia silk and cotton blanket, South China, 19th century. Although this exquisite textile is from the largest Chinese minority, the quality of its work places it among a small rare group of superb weavers. Hua Yao embroidered skirt, Hunan, China, early 20th century. 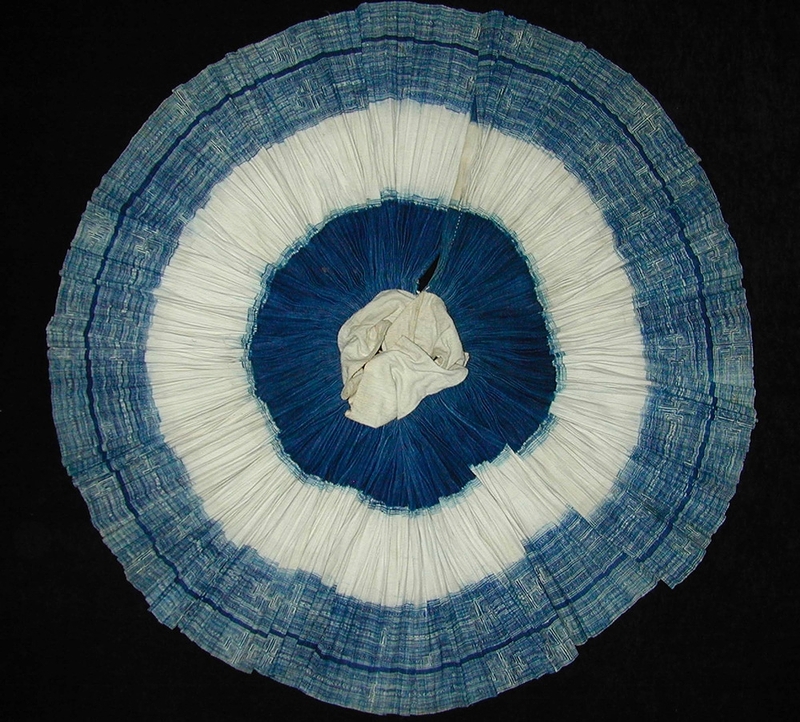 A rare complete and all original Hua Yao woman's skirt. The main section is embroidered with cotton mostly in cross stitches and is bordered by two gathered cotton panels woven in silk supplementary weft. Run Li skirt, Hainan, China, early 20th century. Run sub-tribe skirts often incorporate genealogy, architecture and everyday life into their woven patterns. Yao cotton baby carrier, Guangxi, China, late 19th century. One of the most beautiful examples of Yao appliqué with a lovely balance of color, design and protective devices. Yi silk and cotton robe, Yunnan, China, late 19th century. Malipo Yi man’s tunic with silk appliqué on cotton and in trim on the sleeves (a beautiful and unusual addition); and cotton batik sleeves and hem. This tunic appears to be in rare original and excellent condition.